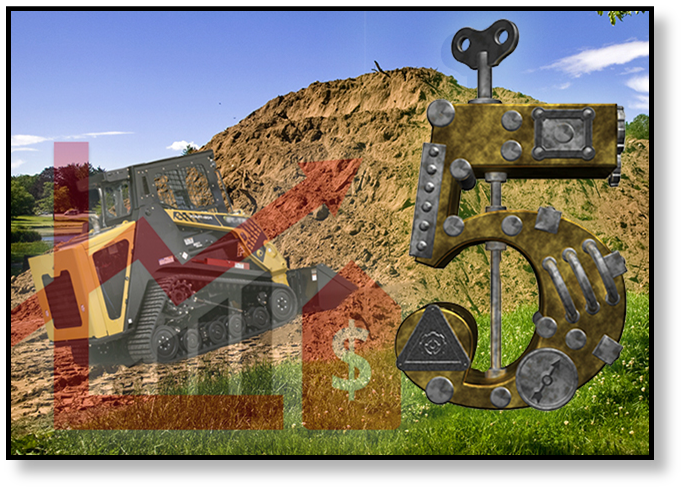 The undercarriage of your heavy equipment can account for up to 50% of your O&O costs over the lifetime of your machine, whether its a compact track loader, multi-terrain loader, or excavator. That means keeping the undercarriage well-maintained is very important, so in this blog post we are going to discuss five simple keys to effective undercarriage maintenance. The undercarriage includes the tracks, chains, track links, pins, idlers, rollers, track pads, bogie wheels, and sprockets. It must interact with the hydraulic system of the loader, including the final drive hydraulic motors. These facts apply whether its a New Holland CTL or a Caterpillar MTL. The first key to maintaining your undercarriage is a daily inspection, which allows you to recognize problems before they get out of hand. Before starting a shift, always take the time to perform a visual inspection of the undercarriage. You are checking for loose hardware, leaky seals, dry joints, or abnormal wear patterns. This should be easy to do if the machine was cleaned off the day before. 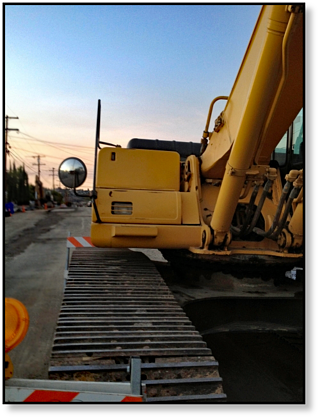 Note that some experts recommend a complete undercarriage inspection every 1,000 to 2,000 hours. And minimizes fuel usage because a significant build-up of debris like dried mud, rocks, gravel, and other debris can increase the weight of the machine. Remember that frozen or hardened debris will not only increase the wear on your machine but can get packed in tightly around the final drive and lead to damage of it's the main seals, which in turn can lead to very expensive repairs or even replacement. Don't forget hat if you are having a hard time getting this kind of debris out of your undercarriage you can use a a hose or, better yet, a pressure washer at regular intervals during the day. Another aspect of maintaining your undercarriage involves track tension. 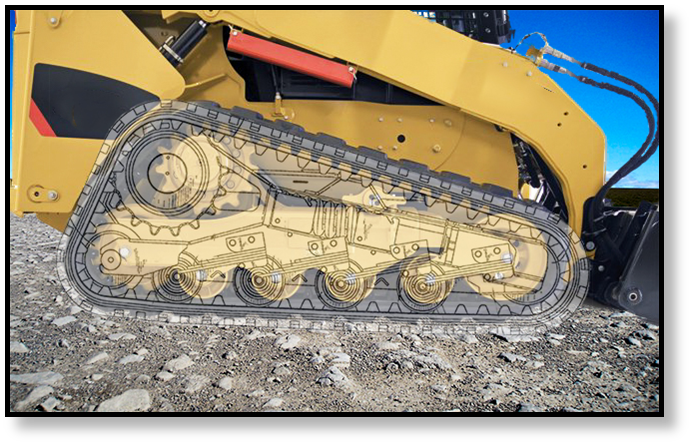 Incorrect track tension will increase stress in key components while speeding up the rate of wear. Most experts agree that track tension should be checked every 10 to 15 hours of machine use, however don’t forget that before you check and adjust the tension you should run the machine about 30 minutes to give it a chance to acclimate to the working conditions. If the track tension is too tight, it will cause unnecessary stress on the undercarriage and drive components while wasting horsepower and, in turn, fuel. If the track tension is too loose, the bushings and sprockets are going to experience excessive wear. A good rule of thumb is this: track tension should be slackened when working in muddy environments and tightened for harder ground (and rock) conditions. The width of shoes for your tracks has more of an impact on the life your undercarriage than you may think. Shoes that are too narrow will cause the machine to sink into the ground and allow debris to get tightly packed on the roller frame, which in turn increases wear and makes it much harder to clean. On the other hand, if the shoes are too wide then they may bend or crack, as well as wear out more quickly. In addition, wide shoes don’t work well on hard ground or around rocks. 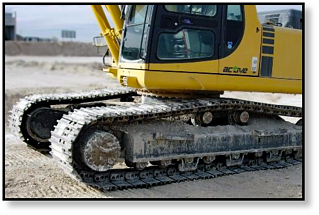 When it comes to track shoe width, experts advise you to use the narrowest shoe width that still provides the function and level of flotation that you need for the job. 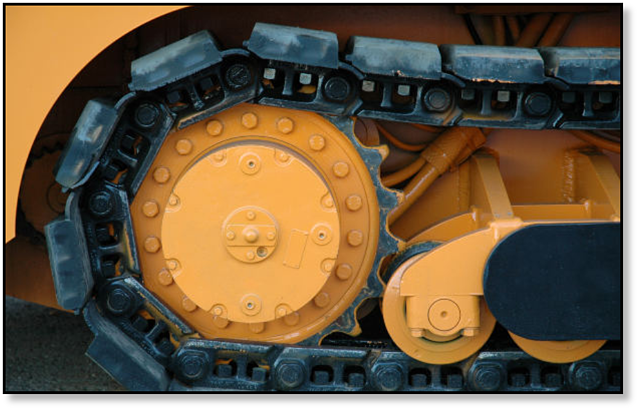 The undercarriage represents a significant part of your machine investment, and taking good care of the undercarriage will benefit other key components, from the tracks to the final drive motors or track motors. Consider your undercarriage maintenance to be part of your final drive maintenance. The advice given in this article applies regardless of brand -- CAT, Bobcat, Terex, Case, New Holland, etc. Taking the time to perform regular inspections and maintenance, along with smart operator techniques, can quite literally save you thousands in repair costs. Recommended best-in-class remanufactured final drive motors come from Texas Final Drive. Continuous inventory updates provides hard to find motors for time-sensitive demand. Check out the New Holland Compact Track Loader Hydraulic Motors inventory.